Jacto Backpack Sprayers are heavy duty commercial sprayers with an attractive price point for both the professional & intermediate user! Ergonomic trigger valve design with lock, poly wand with adjustable cone nozzle, left hand pump only, internal poly piston pump with a single chemical resistant Santoprene® pump seal, working pressure up to 130 psi with pressure relief valve, bypass agitation, quick adjust/release padded straps, pump handle lock, wand storage clip, carry handle and all parts are interchangeable between the two backpack sprayer models. Tested for over 1000 hour’s continuous operation. The Jacto Backpack Sprayers are Designed with Your Comfort in Mind with Their Adjustable Padded Straps! Jacto XP Sprayers Show the Easy to See Fluid Levels in Gallons and Litres! 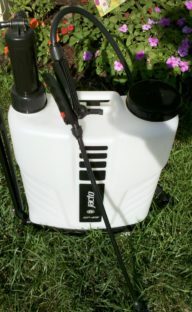 Another extremely popular Jacto Backpack Sprayer is the HD400 4-Gallon sprayer. 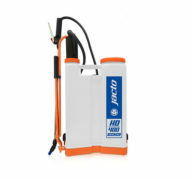 The Jacto HD400 4-Gallon Backpack Heavy Duty Sprayer has an internal mechanical agitator that keeps powdered chemicals such as kaolin clay organic insecticides in suspension, as well as liquid chemical additives.